Get Your Snake Valley Cookbook Now! Right now there's an opportunity to get a piece of Snake Valley--Snake Valley culinary experience, that is! 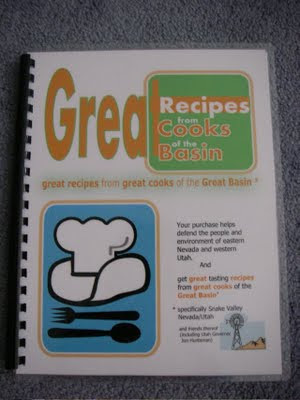 The cookbook Great Recipes from Great Cooks of the Great Basin is available, with a limited quantity available. 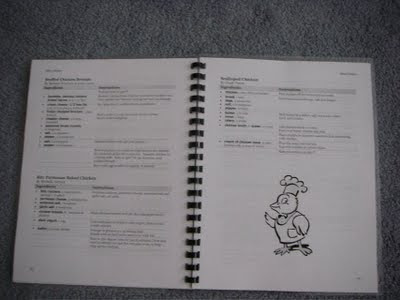 The recipes are laid out in an easy-to-follow format, and there are lots to choose from. Some have been handed down from generation to generation, while others are modern adaptations to please any palate. The cookbooks cost $15 each, plus $5 for shipping. To order, email Ken Hill at kenfhill84083 @ gmail.com. (Delete the spaces on either side of the @ sign if you're copying and pasting the email address.) Some cookbooks may also be available at the Border Inn. Proceeds go to the Great Basin Water Network. They make a great gift and are a wonderful way to have a piece of Snake Valley in your house, wherever you live! Gretchen wrote an initial account of the first annual Snake Valley Festival and I'd like to add some thoughts on that event and the community that organized it. I too, went to the Friday night feed in Garrison and had a great time! Such good food and such a delectable array of deserts! Ah well, one has to indulge sometimes and it was all so good. I got to see some old friends, met some new ones, and had a great time visiting the Garrison metropolitan area for the first time! Later that evening, I enjoyed a bit of music and a touch of poetry in the sylvan setting behind the Lehman Caves Visitor's Center. Andy, just so you know that you were successful, I repeat, "Adam had em'!" Later, while camped a bit outside of Baker, I delighted in the light rain that fell. One has to have lived in the desert for a good bit to derive such enjoyment from such a simple thing as a bit of precipitation as deeply as we do in the west desert! Saturday morning started with a wonderful cup of coffee poured by Terry Morosco at the Silver Jack and then on to the ample breakfast cooked up on the patio at T & D's. Again, moderation was not in the cards but hey, it was for a good cause! After borrowing a table from Desert Survivor (thank you Gretchen! ), I set up with Fish Springs literature for free and shirts for a reasonable financial consideration. However, some folks, who apparently knew that I had been afflicted with a disorder for buying books for a long time, set up right across the street and it did not bode well for my cash outlay. While I tried to stay over on my side of main street, it turned out I was not strong and in three trips to peruse the selection, I ended up with five books! I rationalized it by telling myself it was all for a good cause! After being relieved for a bit by Brian Allen, my second in command here at Fish Springs, I cruised the other booths and ended up with two bird feeders and a big stockpot. I was beginning to wonder if the Prius would hold it all! On to the silent auction where there was an amazing array of superb items. I bid on several in a spirited effort but alas, was eclipsed on every item! I sure hope the person that outbid me for those tasty looking jellys enjoys them while I do without! The parade was a real highlight. My adopted retirement community of Torrey,Utah has a similar parade on the 4th of July and the small town touch they each have is priceless. No big floats for this parade watcher. I'll take two local water heroes in an old Model A and one big front end loader any day. This was also the first time I did not have to try and out compete all the short people for my favorite candy. I suppose if the Snake Valley Festival is an annual event, they will get the concept of scrambling for the goodies down quickly and this old man will be left in the dust! The evening bar-b-cue and auction at the Border capped it all. Denys was a veritable whirling dervish and seemed to be three places at one time in orchestrating the evening and making sure everyone had what they needed. Kudos for such a stellar effort. The food was scrumptious and I managed the trifceta for showing absolutely no restraint in regard to consuming a prudent quantity of food! The auction was well attended and there was surprisingly spirited bidding for most items. Again, I was outbid on a couple of items but I'll just tell myself that I contributed to getting the final price up for a good cause! The entire effort was a real tribute to a far flung but connected community. It is hard for those from more urban area to grasp when I tell them my "neighborhood" extends south to Baker and Garrison, west to Ibapah, north to Dugway, and east to Delta. Those who live in the west desert nod in agreement when they think of this. We are all connected by our passion for this wide open, spectacular, arid landscape and those bonds stretch over distances unimaginable to most. The Snake Valley Festival was a true celebration of that community. We are all threatened by the efforts to take groundwater and while it has perhaps made many of those community bonds more visible to the outside world, we did not need the Festival to know they are strong. A goodly sum raised for the war chest and we had an opportunity to come together to celebrate our community. A grand time indeed! A tip o'the hat to all who worked so diligently to organize it and to all those who donated time, auction items, money, and sweat. I'll look forward to Snake Valley Festival II. I'll bet it will be even better!